Many schools now incorporate some phonics teaching in the early stages of reading. One approach to phonics teaching is known as Synthetic Phonics, which is particularly popular in the UK. Children start by learning a few phonic sounds (the distinct sounds that make up words), then learn to combine these in order to read whole words. They are soon introduced to more sounds, then learn different ways of spelling the sounds they already know. Most parents will have little idea of what Synthetic Phonics is all about, unless they have older children who have already learned to read using this method. Yet parental support is considered vital in helping children gain reading practice at home. Fortunately many schools will provide parents with an overview of the Synthetic Phonics methodology. But this information varies from school to school and can often seem inadequate when parents are trying to support their children effectively with their reading homework. This is the predicament I found myself in. I understood that there are more than 40 phonic sounds (phonemes) and that nearly every sound has more than one way to spell it (graphemes). For example, the sound /e/ as in 'egg' can also be spelt -ea as in 'head' or -ai as in 'said'. I could find details of all the phonic sounds quite easily. What I struggled with was finding a succinct overview of the various different spelling alternatives for each phonic sound. When my son needed help reading a specific word, I would tell him the sound he was struggling with. "In this word the 'e' and 'a' together makes the sound /ee/, so that word is /m/ /ee/ /t/ ... meat." But then we would come across 'key' and 'chief' and I would find myself wondering how many different ways there were to make the phonic sound /ee/, and hoping my son wouldn't ask me because I didn't have a clue. As there was no structure to hold my explanations together I felt confused myself, and was sure this confusion must be rubbing off on my son. That's when I discovered Debbie Hepplewhite's Alphabetic Code charts. Suddenly it all became clear to me. This was the link between the phonic sounds and their different spelling alternatives that I had been missing. These charts are the basis for the Oxford Reading Tree and the Phonics International reading programmes. There are a number of different versions of the phonic sounds chart so you can choose the one you prefer. You can also find other free activity sheets and games based on these charts. In the Alphabetic Code chart the 40+ sounds are always shown in slash marks (/-/) down the left hand column of the chart and the spelling alternatives of those sounds are presented across the rows. The sounds are not listed in alphabetical order. They are listed in the order of introduction of these sounds in the Jolly Phonics programme, which is a very popular starter synthetic phonics programme for teaching children to read. Jolly Phonics choose to teach certain letters first (s, a, t, i, p, n) because they make more simple three-letter words than any other six letters. I immediately printed off a copy of the chart and started using it to support the explanations I provided my son when he came across words he couldn't read. I am sure this is helping him and it is certainly making me feel more confident that I am supporting him as effectively as I can. I also found some useful generic tips on Debbie Hepplewhite's website for helping your child with their reading homework. If your child is learning to read with synthetic phonics at school, or if you are teaching phonics to your child at home, they will be taught the phonic sounds and spelling alternatives in a systematic way, a few at a time. This takes time and so when your child practices reading with you, they are certain to come across sounds which they have not learnt yet. You can try and read books which just contain the phonic sounds they have already learnt, such as with these early reader books based on phonics. However, inevitably you will still come across new sounds from time to time. You should grab these opportunities to provide incidental phonics teaching to your child. Teach your child that when decoding words they should feel free to try alternative sounds and modify pronunciation until they can make a 'real' word. For example, if blending with the short vowel sound doesn't work (such as the 'a' in apple), try again with the long vowel sound (such as the 'a' in table). Or try 'tweaking' the sounds to find a word which makes sense, such as for ‘of’, ‘his’, ‘the’ and ‘put’. Learning to read is about applying common sense and is not a totally precise art! When your child comes across a word they cannot read, you should say “In this word, those letters [point] ARE CODE FOR the /___/ sound”. Then let your child carry on and blend the word. Certain children may begin to remember the alphabetic code taught incidentally in this way. Others may need further practice at school on this specific sound or grapheme before they remember it. 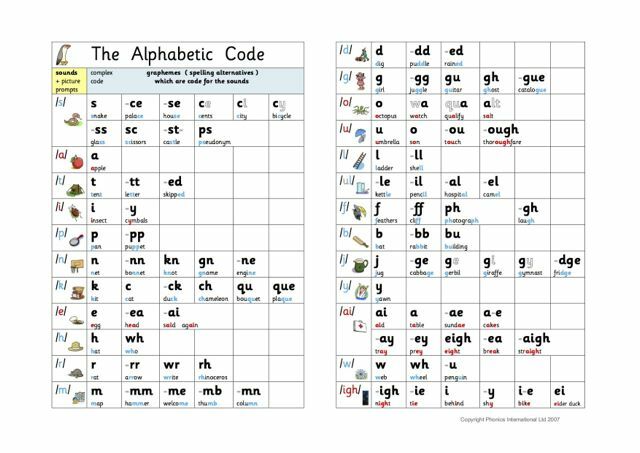 However, what you can now do is mark your Alphabetic Code chart to show that you have discussed this sound or grapheme with your child and then review later to help make it stick. For sounds and spelling alternatives that need extra help to stick you could even try playing this Read and Post game.